Cassava plants exhibiting mild symptoms of cassava mosaic disease (CMD) were collected from Unguja island, Zanzibar. Cuttings grown from these plants in the glasshouse produced similar symptoms, which were milder than those caused by other known cassava mosaic geminiviruses (CMGs). The whitefly vector, Bemisia tabaci (Gennadius), transmitted the putative virus to 27.7% (n = 18) of target plants. Total DNA extracted from diseased leaves did not yield diagnostic PCR-bands using virus-specific primers to known CMGs. Degenerate primers, however, produced a diagnostic band indicating the presence of a begomovirus. Full-length DNA-A (2785 nucleotides) and DNA-B (2763 nucleotides) components were subsequently PCR-amplified, cloned and sequenced. Phylogenetic analyses of DNA-A and -B sequences showed that they were most similar to strains of East African cassava mosaic virus from Tanzania and Uganda at 83% and 86% nucleotide identities, respectively. 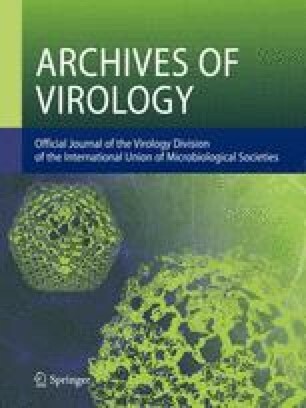 The number and arrangement of open reading frames were similar to those of bipartite begomoviruses from the Old World. DNA-A was predicted to have recombined in the intergenic region (IR), AC1 and AC4 genes, and DNA-B in the IR. A maximum nucleotide identity of 83% in the DNA-A component with other sequenced begomoviruses, together with different biological properties allows this virus to be recognised as belonging to a new species named East African cassava mosaic Zanzibar virus (EACMZV).